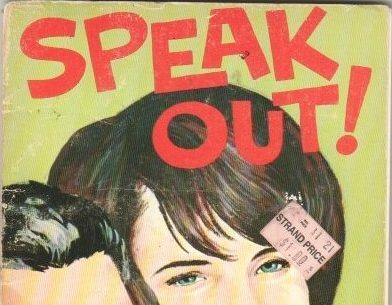 The Last Twentieth Century Book Club: Speak Out! Growing up in the nineteen-nineties, it was hard not to come away with a romantic idea of the American teenager — especially the teenagers of two decades before. I was bombarded by constant, gold-tinted recreations of my parents’ youth on television, an endless montage of screaming crowds on the Ed Sullivan show fading into painted Woodstock bodies into raised fists and burning cars. Teenagers, I was told, existed in an important pop-cultural nexus: their taste, and spending power, steered the aesthetics of decades. Their political opinions, to the degree that they existed at all were worthy of consideration. . To be a teenager, I thought, was to be at the center of things, to be, at least potentially, cool. It’s embarrassing to admit, but seeing divergent opinions on the matter still gives a kind of brain-freeze. At some fundamental level, I assume that teens have agency, that they know best, and that their generative cultural powers trump any and all arguments for good taste and moderation. Positions to the contrary tend to come off as camp. To address the issue, Speak Out provides the stories of the Apostles’ witnessing, in Acts, as a fit model for emulation. At the same time, in the additional photographic sections, it addresses more practical concerns, and suggests ways in which its readership can apply biblical lessons to their “world of sports, work [and] studies.” The results are often bizarre. A concern with youth “activism” is noticeable throughout Speak Out!, although the word is unfailingly qualified by the argument that “most [teen activism] is typical games and parties.” This lack of recognition for the political agency of teens seems needlessly patronizing now, especially on the page depicting “obviously … anti-Establishment” girls. However, in the context of Speak Out’s production and intended audience, they make perfect sense. This produces the booklet’s most interesting page, which arranges a reflection of Myra’s beside an ambiguous poem from Sonia Wardle and the image of a short-haired, poorly-lit young woman. “Do we sometimes confuse culture with Christianity?” it asks, from a position somewhere between sympathy and pity. The sympathy may be found in Wardle’s poem, “The Outsider, which embodies the thoughts of its irreligious protagonist so forcefully that it can be read as a credible counter-example to Speak Out’s entire ministerial enterprise. Wardle’s narrator is a “proud unreachable,” and her condition, though anguished, seems to have been assumed with such overpowering force that it earns the reader’s respect as an act of willpower. While it is tempting to assume the sympathetic reading as unintended, Myra’s commentary treads similar water, summarizing the concern that religious conversion might amount to nothing more than a transformation of style, the creation of a “carbon copy.” This, Myra argues, is missing the point. Fashion, music, cigarettes, hair-dos – these are superficial things. They are also, ironically, icons of what I identify as teenage agency. Speak Out refutes this notion by arguing for the existence of a deeper agency, founded on the same conversion which the larger Campus Life project positions as the cornerstone of social change. On my first reading, I’ll admit I laughed my way through this material. Speak Out and Youth for Christ International are definitely not “cool” in any kind of identifiable way. But they aren’t trying to be — and that’s the trick. Speak Out, from the perspective of its authors, actually respects the political and social potential of teenagers far more than the counter-culture, which it sees as lightweight and unproductive. If social change is generated by conversion, inspiring teens to witness is inspiring them directly towards social change. Speak Out actually agrees with my implicit understanding of the “teenager” as existing in a nexus of cultural power — it just doesn’t share my pop-focused understanding of culture. That’s an interesting message, and a nuanced one. I almost missed it entirely. That said, sixteen-year-old me wouldn’t set foot in a “gigantic pillow fight involving hundreds of Christian teens” if you paid him ten-thousand dollars. These days I’d do it for free.